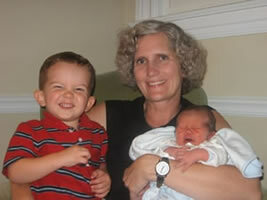 Noel Leithart attended her first birth as an assistant in 1990 and was first a doula at a hospital birth in 1993. Noel is a Certified Professional Midwife (CPM) through the North American Registry of Midwives (NARM). 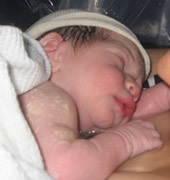 She has attended nearly 300 births, either as assistant or primary midwife. Noel and her husband have 10 children, 8 of whom were born under the care of midwives. Did you know that having your baby at home can be as safe as having your baby at the hospital, if not safer? Although the WHO (World Health Organization) recommends that C-sections should not go higher than 15%, more than a third of women in America have unnecessary interventions resulting in a c-section. For more information on c-sections, the accompanying risks, and how they can be prevented, see International Cesarean Awareness Network (ICAN) website. Site design and maintenance by Double Dead Frog. Graphics by the Inspiration Gallery. Copyright © Fruitful Vine Midwife. All rights reserved.